If I would have named this page 'Halema'uma'u' most of you probably would not have known what it was about, hence the naming of the page 'Kilauea'. The Overlook Crater inside of the larger Halema'uma'u Crater that sits within the Kilauea Caldera has been erupting for 8 years now. This year marks the first time that the lava can be seen from the visitors center at the Jagger Museum at Volcanoes National Park on the Big Island of Hawaii. The Kilauea volcano is one of the most active volcanoes in the world and probably the most accessible. 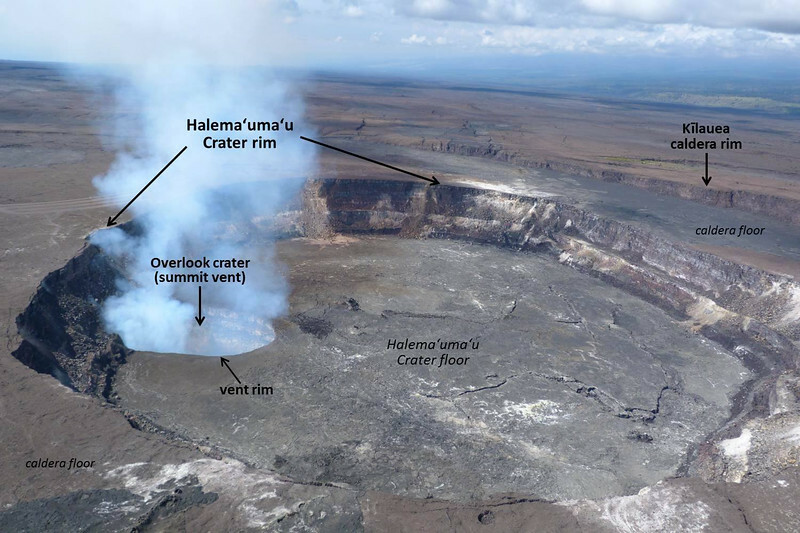 Normally the lava level is about 200 feet below the rim of the Overlook Crater, but as of April, 2015, the lava has risen dramatically, eventually spilling onto the floor of the larger Halema'uma'u Crater. The viewing platform is about 1.2 miles from the erupting lava. The history of Kilauea eruptions can be found here. The image detailing the craters is copyright Hawaiian Volcano Observatory. The plume of smoke and gas rising up from the Overlook Crater is deadly, full of particles and Sulfur Dioxide that forms a devastating vog that envelopes different parts of the Big Island and goes where the trade winds take it. The Island of Maui and Oahu feel the effects of the vog on a regular basis. The images in the Kilauea Gallery were taken within Volcanoes National Park, capturing the various conditions at the 4,000' elevation of the volcano and crater. Weather patterns constantly fluctuate from clear skies, pouring rain, fog and vog. You just never know what you will find until you arrive, with the view changing by the minute at times.